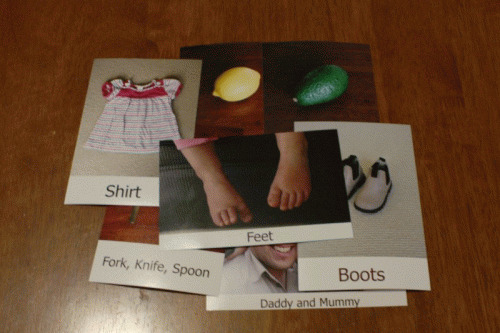 Here is a small sample of the flashcards we made for our daughter. She is just stringing words together and gets frustrated trying to communicate sometimes. We thought she would learn quicker with items she knew rather than commercial childrens flashcards from the US or UK. So we took photos of everyday things in her life, added the word to the bottom of them, and printed them out like normal photos very cheaply. As her vocabulary expands we can take photos of new things and introduce them to the deck.